It’s been an amazing campaign for Southend on sea 4 piece ASYLUMS and their brand new single JOY IN A SMALL WAGE which is coming out on D.I.Y imprint COOL THING RECORDS at the end of June! It’s been getting lots of airplay on XFM, BBC RADIO 1 and BBC 6 Music to name a few!..BUT!! !...This week has JUST GOT INTERESTING though!!……“HOW ? “ we hear you say?! — Well, let us tell you…… the radio legend Steve Lamacq has put ASYLUMS forward for a chance to be part of the next BBC 6 Music playlist….which as it sounds, is a great opportunity! 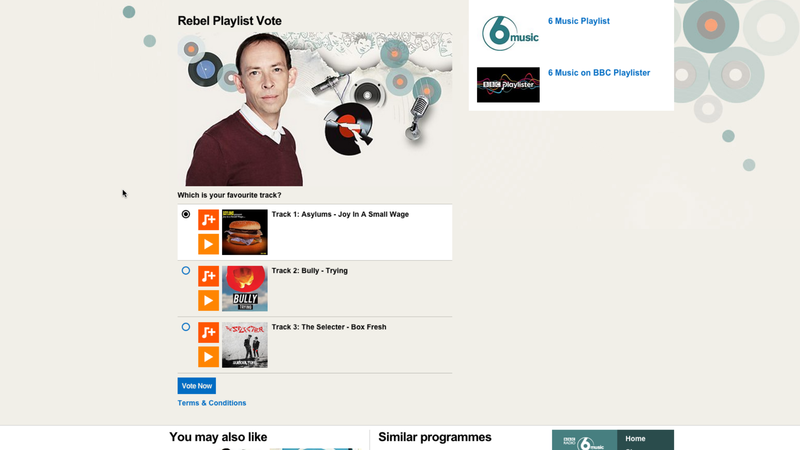 — 3 acts have been included in what is called the REBEL PLAYLIST.….and in simplest terms…..ASYLUMS need your good vote!……Your vote will play a big part in sending ASYLUMS onto BBC 6 Music’s REBEL PLAYLIST….! So if you have a spare second, please click the link below and be a fully functional limb in what’s been an amazing journey of DIY music creation so far. This band make great great music and your vote will ensure this great great music gets heard. We shall leave their fate with your good selves. Voting closes this Sunday at Midnight ( May 24th ). *This Webpage is share-able – click the social share buttons below and send this far and wide. Thx!